I love to run. I find it relaxing and challenging at the same time, a way to clear my head and provide me with a break from my regular routine on the bike. 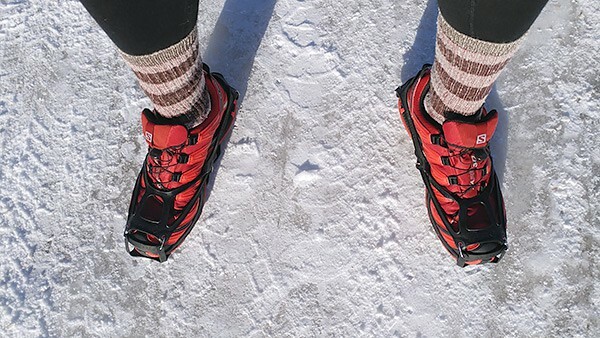 I try to do it all year round, but I live in Eastern Canada, and running outside in the winter in Eastern Canada – in Canada in general, actually – can be a tough sell to many. In the warmer months, choosing how to dress for your run is generally straightforward. You want something breathable, shoes that are broken in and comfortable, maybe some sunscreen and a pair of sunglasses and a hat, and you’re off. Winter changes all that. It’s below freezing. There is often snow on the ground. Worse, there is often ice, with or without snow on top of it. The wind cuts through you like Usain Bolt cuts through the field at a 100-meter race. For me, there are two main issues to deal with when you run in the winter. The first big problem is traction, or the lack thereof. Slipping on ice is a real problem, and falling hard can leave you injured. Fortunately, there are options. 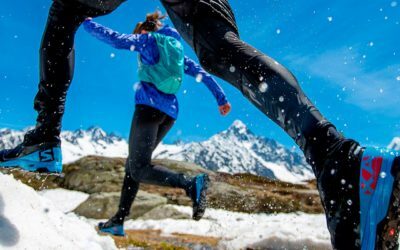 If you plan to run outside a lot in the winter, you should look at some sort of traction device, either for your existing running shoes, or something with traction built in. For me personally, I take the former approach and either use running spikes that are held on to the soles of my shoes, or I head to the hardware store and buy a dozen or so small sheet metal screws in half inch lengths. It’s important to get bolts with really short lengths, and with the hexagonal heads, because you want the edges to dig into the ice. 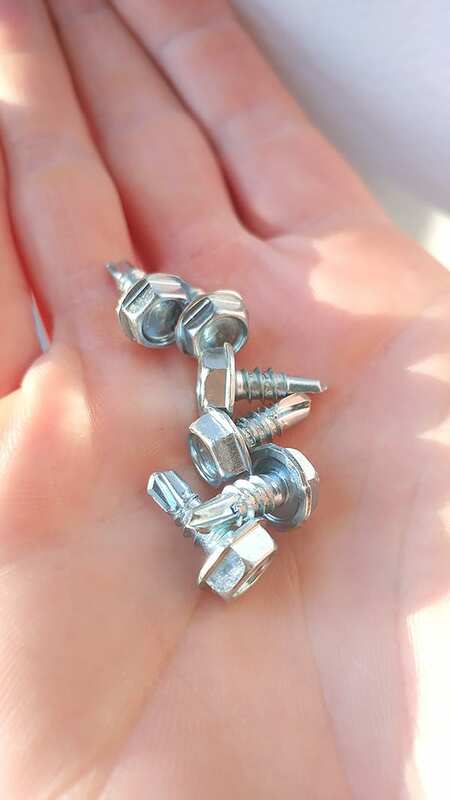 There are also commercial items like this, similar to studs on winter tires, just for this purpose. They have heads with hard edges and I think that they bite the ice quite well. Screw them into the bottom of your shoes, right into the thickest parts of the sole. Not sure where to put them? Grab an old pair of your shoes and look at the soles. The areas that are the most worn out are where you are putting your foot down the most. For me, it’s the outside of my foot and the back of my heel when I run down hill. If you’re not keen on screwing bolts into your footwear, or you run a minimalist shoe with thin soles, something like the Spiky Plus from Petzl might do the trick. They provide a few carbide spikes, strategically placed, to give you extra grip. Or, go all out and pick up a pair of Spikecross shoes from Salomon, which have spikes built right into them. Just be careful about wearing them in the house, or on very hard surfaces. They will be very slippery on ceramic tile, for instance. Traction problem solved, so now what? Staying warm, that’s what. 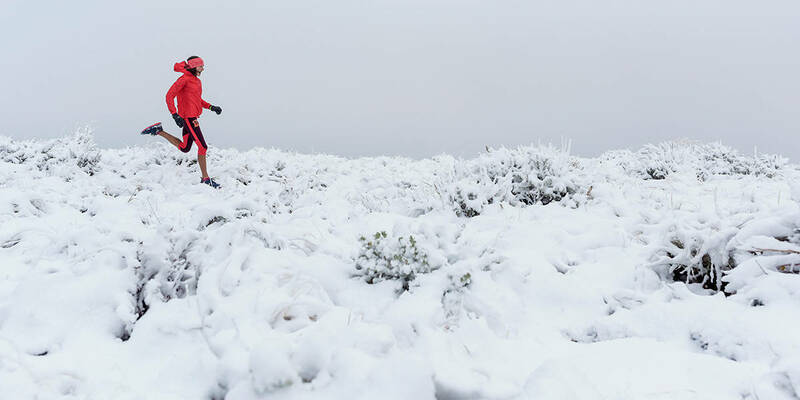 The hardest part of a winter run is the beginning when you aren’t warmed up yet. It is tempting to overdress, and then you end up worse off, sweaty and freezing, later on in the run. For me, what works best is two layers of wool, a thin one and then something heavier, and perhaps a windproof shell on top that has built-in ventilation. I usually choose a long sleeve thin base layer, and then add an Icebreaker Stratus jacket on top. That way I can regulate my body temperature by opening and closing zippers. This combination keeps me comfortable in temperatures down to -15C. If you’re worried about your feet getting wet, you can look at shoes with a GTX label, or else shop around for a waterproof sock. In a pinch, when I’ve really wanted to run in slushy conditions, I’ve used plastic bags between my sock and shoe. Add your favorite winter beanie and a pair of mittens (I prefer mittens to gloves because they keep my fingers warmer), and you’re ready to rock. If the snow is really coming down, I switch to my snowshoes. For cross training, I think it’s an excellent winter activity that works many of the muscle groups involved with running. Tromping around in deep, fluffy powder is not only extremely fun, but it is also a great workout. Race up a sledding hill, jump on your sled and slide down, snowshoes and all, and then repeat. Add hot chocolate or coffee and you may never want to come back inside. Ultimately, I think running in the winter is largely a mental thing. With a bit of preparation, running in any sort of weather is a lot of fun, and I don’t think winter needs to push you indoors and onto a treadmill full time. Think of how fast you’ll be come Spring.